The Phillips celebrates the fifth anniversary of its Intersections contemporary art series with Intersections@5, an exhibition comprising work by 20 of the participating artists. In this blog series, each artist writes about his or her work on view. In pieces of the love letter: the common tongue, fragmented sheets of paper are left unmarked by ink, but are held together by mending tape, which is alternately adhered to or suspended above the paper. The love letter is repetitive and frantic. It attempts to lay claim to something solid and precise and yet it seems always on the verge of disintegration. The love letter figures in this work figures as a privileged marker of the impossible adequateness of language and desire. The ability to express a seemingly universal emotion is perpetually placed in question, both by the work and by the authors of the language they employ. 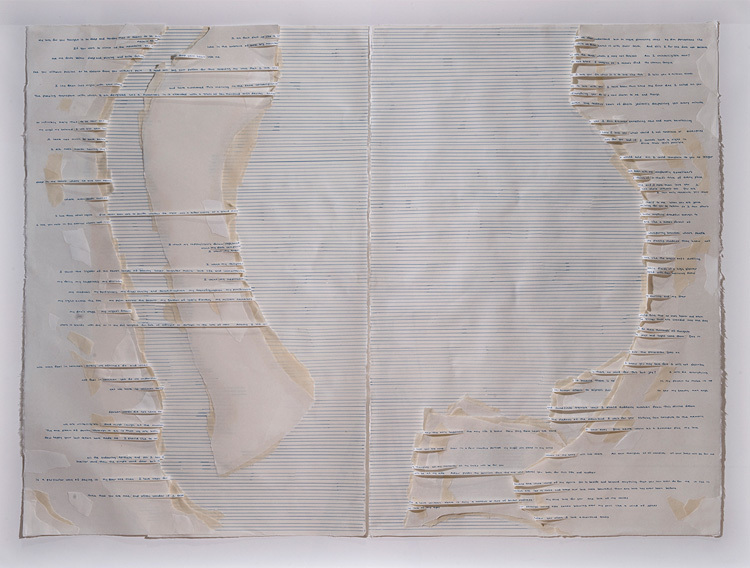 This work furthers Daou’s exploration of the intersections between writing, speech, and non-verbal modes of communication. As elsewhere in her work, language emerges as a site of both ruin and repair.